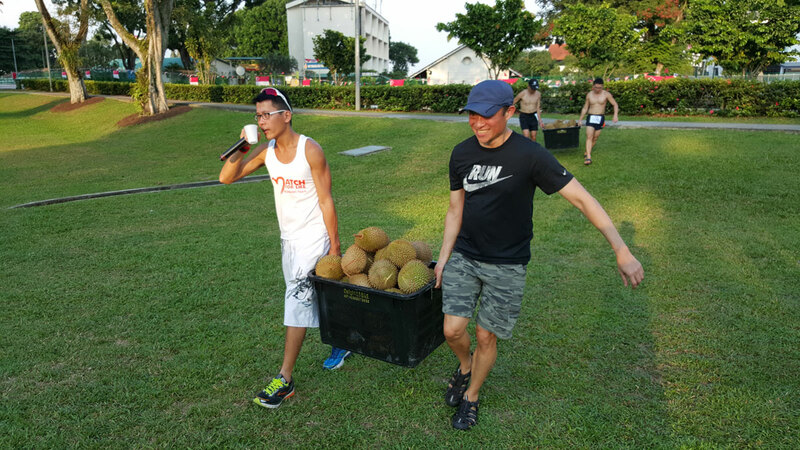 Race Review: Durian Run Singapore 2015 (by Zhiyong) | JustRunLah! What is the best way to celebrate an unbelievable durian harvest? In Singapore, of course, is to organise a durian run/feast. In most races, runners get finisher medal/t-shirt. 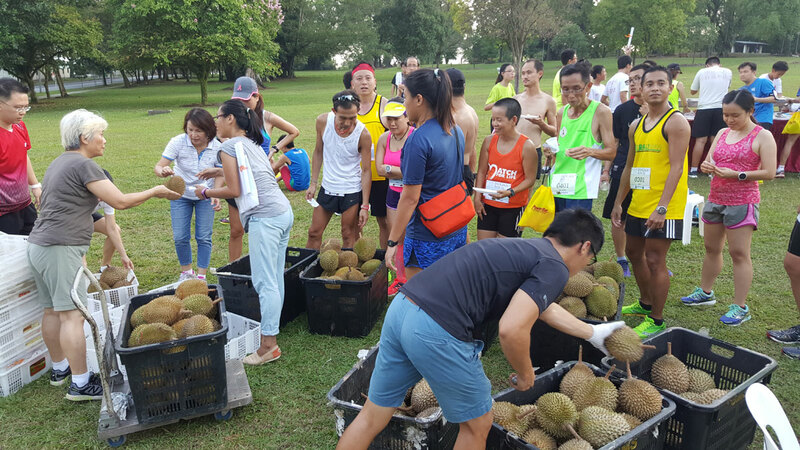 At Durian Run, all 4 runners in the team enjoy a basket of 6 durians as reward. Additionally, runners got to enjoy an ice-cream from mobile ice cream uncle, while buffet meal was also catered! 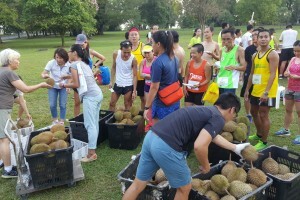 The inaugural durian run took place at Sembawang Park. A unique location to host unique a running event. Having reached the venue at 3pm, the weather was pretty hot. Luckily when later on around 4pm, there was shade at the transition area where all runners gathered. The concept of the race was interesting and encouraged runners of all levels to take part. It was a 4-person relay, and each person had to take turns to run 1.2km four times. Therefore, there was constant action at the transition area with team mates hanging around and cheering their buddies on. 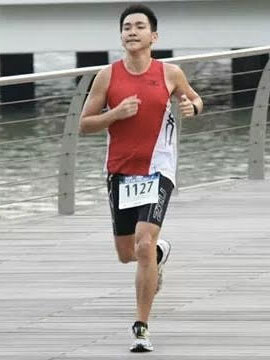 Awesome effort from the organiser/runner Ah Siao! Definitely a delightful union of smiles and miles! The route was like a roller coaster ride. It consisted of a short climb up a grass slope at the start/transition point and various ups and downs along the road within Sembawang Park. The park was also not crowded which was very nice to run at. Importantly, it provided a refreshing scenery while racing. The race was promoting the Bring Your Own Bottle (BYOB) initiative as part of their effort to reduce wastage of cups used for hydration. After racing, every team could then sit around the shaded lawn and enjoy the food (ice-cream, buffet food and durians) while happily chatting away. 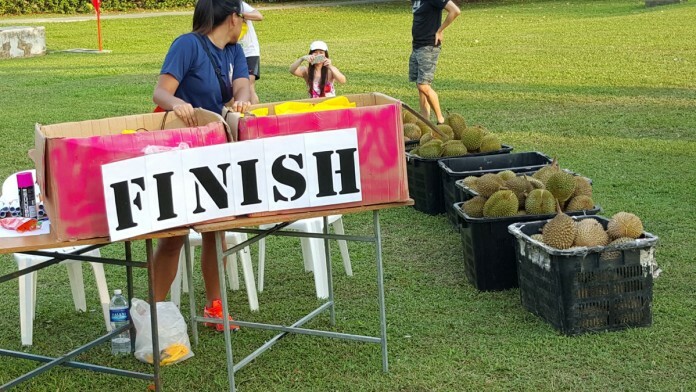 Great run , fantastic Durians really enjoy the event . See ya next year … You will be back rite ? Durian run ?? ???? From the Dur’n Ah Peh .